With the upsurge in probiotic foods and drinks in the food marketplace, this paper explores some of the science behind fermentation and the scientific evidence supporting claims that nurturing our gut health and specifically our gut microbiome (friendly bacteria) can be important for our physical, mental and emotional wellbeing. As people who practice the “Macrobiotic way” we are aware of the importance of fermented foods and how they can improve our gut health and also our overall health and well-being. In the past few years in the UK, there has been a surge of interest in so called “probiotic” foods, with the introduction of probiotic drinks, some with plenty of added sugar and some smaller brand names with a purer pedigree, as well as living fermented vegetables. Recent research relating to our friendly gut bacteria has resulted in a rash of recent popular book publications on the subject such as The Good Gut by Justin and Erica Sonnenburg and the Clever Guts Diet by Dr Michael Mosley. Here I look at some of the recent scientific evidence on which this upsurge has been based. During the fermenting process, starches, sugars and sometime proteins in vegetables, beans, grains, milk products or even meat are converted into more digestible form through the work of micro-organisms. These natural fermenters are usually bacteria or fungi and may be introduced specifically or we may rely on what is naturally present on the vegetable or in the air (wild fermentation). Here, I’ll be focussing on lacto-fermentation, where starches and sugars in the vegetable, fruit, grain or milk are converted into lactic acid by many species of lactic-acid-producing bacteria (Lactobacilli). Lactobacilli are ubiquitous in our environment, found all around us on every surface, but more especially on the leaves and roots of plants. The presence of these “good” bacteria makes the vegetables more easily digestible, the vitamin content (notably certain B vitamins and sometimes vitamin K2) increases and they augment our healthy intestinal flora. The good bugs also produce helpful enzymes and have an antibiotic effect, inhibiting the growth of other “bad” bacteria. Fermented foods can be found in just about every traditional culture the world over: traditional breads such as sourdough; idlis and dosas from India; maize was pounded and then fermented before being consumed in many cultures throughout the world. Other examples include salamis and hams, yoghurt, kefir, cheese, even wine is fermented, as are all forms of alcohol. In Japanese culture there are many fermented foods and we all appreciate the benefits of miso soup, pressed vegetables, natto, tamari, umeboshi plums. The Japanese enjoy plenty of other fermented products, many less well known to us in the West. Although I have been following a generally “macrobiotic” lifestyle for the past 15-20 years, I only became particularly interested in fermenting foods for myself when I to made my own “umeboshi plums”. At that time, my research on the internet for how to make umeboshi plums came up with nothing clearer than a few youtube clips in Japanese. So, my plums became a bit of a culinary adventure. However, 18 months later the result was fabulous fermented plums which passed for “umeboshi” (right). Generally speaking, many of these fermented foods “self-regulate” (my term). By this I mean that the bacteria present multiply in the favourable conditions, such as the correct salinity (percentage of salt to water can be critical, although I have witnessed that Katz can be quite off-hand about it! ), anaerobic conditions (no air), acidity and temperature. These conditions allow the “beneficial” bacteria to multiply, whilst inhibiting the “baddies”. It is also now well known that the species of bacteria found in sauerkraut, for example, change over the fermentation period. For cabbage-based ferments, Lactobacilli bacteria are introduced naturally, as these air-borne bacteria grow on fresh cabbage leaves. Yeasts also are present on the leaves and if allowed to dominate (for example if the fermentation temperature is too high) may result in a soft sauerkraut of poor flavour. The fermentation process has three phases: in the first phase, anaerobic bacteria such as Klebsiella and Enterobacter lead the fermentation, and begin producing an acidic environment that later bacteria prefer. The second phase starts as the acid levels become too high for many of the early bacteria, and Leuconostoc mesenteroides and other Leuconostoc spp. dominate. In the third phase, various Lactobacillus species, including L. brevis and L. plantarum, ferment any remaining sugars, further lowering the pH. Although it would seem that a fermentation period of 7 to 14 days would be best for, say, sauerkraut, variation in temperature can alter the speed of the process and even the bacteria that develop. Traditionally, sauerkraut would have been considered a good way of preserving cabbage for consumption during the lean winter and spring months. As such, it would probably have been fermented in a large crock in a cool cellar, where it would have remained until eaten. This is in contrast to our warm kitchens, where many make their own sauerkraut. Commercially, it has been long established that the best temperature to ferment cabbage is between 13 and 18 deg C (ref. 6) as too high a temperature can result in overly soft sauerkraut that doesn’t have a good colour. We have a saying in the UK fermenting community: if there’s pink innit, bin it! This refers to a pinkish tinge that can result from the growth of unfriendly bacteria that are best not eaten. 1. Pre-digestion – make the food more easily digestible. Soya beans are the classic example. 2. Detoxification – There are many anti-nutrients in foods (for example phytates) that prevent us from digesting and absorbing them properly. This is why nuts, beans and grains are not easily digestible unless they have been pre-soaked and/or fermented. 3. 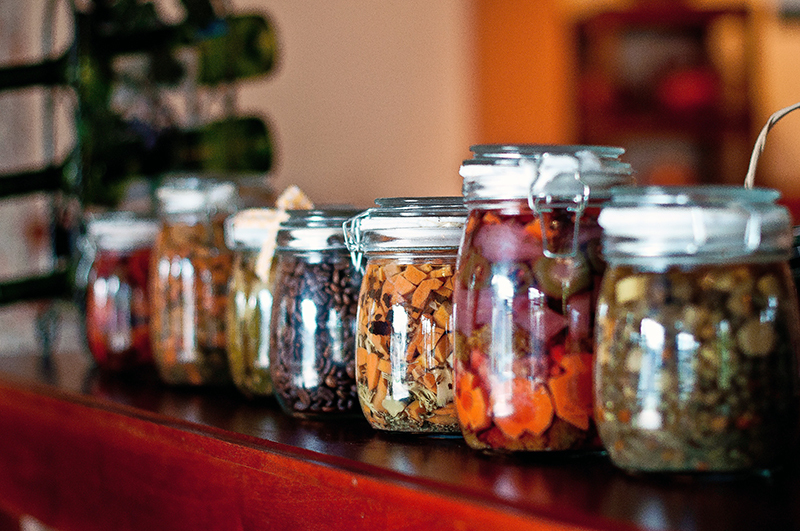 Nutrient enhancement – Different ferments enhance different nutrients. 4. Enhance the good bacteria in our gut microbiome. These good bugs– lactobacilli and others — can be an effective probiotic, that is, they add to the beneficial bacteria and other micro-organisms in our gut (microbiome). Foods containing beneficial bacteria are now known as “functional” foods. It is well established that bacteria can survive the transit through the highly acid environment of the stomach. In 2006 a paper published in the Journal of Gastroenterology concluded that “immune responses can be modulated by probiotic bacteria” and that the bacteria stimulate antibodies and activate macrophages, lymphocytes and nerve cells (ref. 9). But let’s not get too excited, as the following year a summary of scientific studies concluded that “ingested strains do not become established members of the normal microbiota” (ref.10). Who do we believe? As long ago as 1807 the French psychiatrist Phillipe Pinel said: “The primary seat of insanity generally is in the region of the stomach and intestines.” Pinel is known as the father of modern psychiatry and came to this quote after working with mental patients for many years. His words are finally beginning to be researched and understood. To me, this new area of Gut Science is really exciting. Evidence has emerged that our gut bacteria communicate with our brains via the vagus nerve, which is known as our gut–brain axis. This may perhaps be why researchers have found that 90% of the feel-good hormone serotonin is found in our gut rather than in our brain. And, although serotonin may be primarily found in our gut, its influence is exerted directly on our brain. Six years ago, an American scientist Javier and his co-workers created some interesting experiments and were able to see a difference in the stress-response behaviour of rats that had been given a Lactobacillus-rich diet and those that hadn’t. They also demonstrated that there is bidirectional communication along the vagus nerve (gut–brain axis) and concluded that certain organisms may prove to be useful therapeutic adjuncts in stress-related disorders such as anxiety and depression. (ref. 16). So should we be encouraged or disturbed by recent news of “Pioneering research into benefits of nerve stimulation for some conditions” (ref 19)? This article is an interesting review of extraordinary research published in 2016 involving inserting a pacemaker-like device that effectively short-circuits the vagus nerve. Clinical trials have already shown some success in alleviating the pain of rheumatoid arthritis using this device and it is being used to tackle treatment-resistant epilepsy and depression. The importance of our gut microbiome for our physical and mental wellbeing is vast. So, nurturing our symbiotic partners, our microbiome, is vital for our wellbeing. Yet the modern world, so full of antibiotics which our gut bacteria take approximately 2 years to recover from, pesticides and herbicides whose effect on our gut bacteria may not have been considered, is a total minefield for the health of our microbiomes. As scientists are realising the value of beneficial bacteria to our health, it has been proclaimed that probiotics may “prove to be one of our most effective tools against the new and emerging pathogens that continue to defy modern medicine in the 21st century” (ref. 20). Is there any way in which we can influence and shape what may be to come in this field? Let’s not lose our perspective, let’s return to our naturally fermented foods. No single food, and that includes fermented food, is a cure-all. There are a number of considerations that should be taken into account before suggesting everyone reaches for the sauerkraut jar. Part of Macrobiotic philosophy is to take a “big view”, where we consider how our whole lifestyle affects our body and mind; how our diet, the quality and origins of our food affects us. So miso soup, which may be considered a perfect probiotic food — when made with live miso that is not over-heated – which is also rich in prebiotic raw spring onions, is part of a meal that is balanced energetically and nutritionally with other health-giving foods. We have to take care not to have too much of a good thing. In Korea, for example, oesophageal, throat and stomach cancers are common; could this be related to over-consumption of their favourite: kimchi? Too much acidic food (fermented vegetables contain lactic acid) can damage tooth enamel. Fermented foods are also often salty, although vegetables can be fermented successfully with low levels of salt or salt-free. We have to remember that we’re all different. Everyone has their own unique microbiome. It is known that our microbiome is influenced by many factors, including ethnicity (our genes), a number of factors at and after birth (vaginal birth, breast feeding, vaccinations), the environment we grow up and live in, including the foods we eat, antibiotics that we take. It is clear that foods which help one individual may not work for another, depending on their microbiome and their health status. For example, some are unable to tolerate the high histamine found in some fermented foods, such as sauerkraut. For many who have not enjoyed live foods before, it is advisable that they introduce these new foods gradually, starting with small amounts. For others, their gut may require a cleansing programme incorporating other healthful foods before they are able to tolerate or benefit from fermented foods. Our body works as a well-coordinated whole within which there are myriad biochemical and neurological interactions going on all day, every day. The workings of the body are truly astounding. Our microbiome is just one part of that fabulous functioning system and we still have much to learn about how it interacts with the rest of our body and the role it plays in our health and wellbeing. As health professionals we need to keep abreast of the scientific developments in this area. And perhaps we should also be paying fresh attention to those “gut feelings” we have about people, places and situations. 3. Breidt, F. A Genomic Study of Leuconostoc mesenteroides and the Molecular Ecology of Sauerkraut Fermentations. Journal of Food Science (2011) vol. 69, 1, 30–33. 7. Peñas, E. et al. Chemical evaluation and sensory quality of sauerkrauts obtained by natural and induced fermentations at different NaCl levels from Brassica oleracea var. capitata Cv. Bronco grown in eastern Spain. Effect of storage. J Agric Food Chem. (2010) vol. 58, 6, 3549–3557. 9. Madsen, K. Probiotics and the immune response. J Clin Gastroenterol. (2006) vol. 40, 3, 232-234. 10. Elżbieta Klewicka, et al Effects of lactofermented beetroot juice alone or with N-nitroso-N-methylurea on selected metabolic parameters, composition of the microbiota adhering to the gut epithelium and antioxidant status of rats Nutrients (2015) vol. 7, 7, 5905–5915. 11. Chervonsky AV. Influence of microbial environment on autoimmunity Nat Immunol. (2010) vol.11, 1, 28-35. 14. Katz, SE. The Art of Fermentation (Chelsea Green) (2012) p. 22. 17. Mayer, EA. et al. Journal of Neuroscience (2014) vol 34, 46, 15490-15496. 19. Nicola Davis, Pioneering research into benefits of nerve stimulation for some conditions The Guardian 9 September 2017 p. 13. 20. Alvarez-Olmos MI, Oberhelman RA. Probiotic agents and infectious diseases: a modern perspective on a traditional therapy. Clin Infect Dis. (2001) vol 32, 11, 1567-1576. 21. Dr Lindsay Hall, Microbiome Research Leader, Quadram Institute, Institute of Food Research, Norwich Research Park, Norwich. Versatile and Beneficial Microbes Live event Science Café, The Cut, Halesworth, 27 October 2106.